About 1200 years ago in Japan, green tea was highly valued and treasured as precious medicine. With the advent of new harvesting and processing techniques, it soon became the country's most popular beverage. Today, Japanese green tea's health benefits are widely known not only in Japan, but around the world. Catechin, also called Tannin, is a bioflavonoid that has both antiviral and antioxidant qualities. It helps to prevent cancer by inhibiting the growth of cancer cells. Catechin also has many positive cholesterol-lowering effects. It helps to clear blocked veins and arteries, allowing your blood to flow more smoothly. Some studies show that Catechin may help prevent strokes, heart attacks, blood clots and even heart disease. Amazingly, Catechin also protects the entire body from oxidative damage due to free radicals and other toxins in our environment. Tea leaves create Catechin to protect themselves from ultraviolet rays. 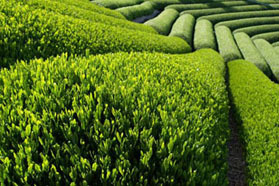 So although all Japanese teas contain Catechin, those grown in full sunlight such as Sencha have the most Catechin. Catechin is extracted best in water with a temperature of over 167 - 176F (75 - 80C). Free radicals (activated oxygen) are powerful oxidizing agents in the body which are known to cause a wide variety of diseases, aging, and wrinkles. Free radicals increase by overexposure to ultraviolet rays, aging, smoking, and too much drinking. If you want to remove free radicals that have been created in your body, you may do this by consuming foods that have strong antioxidant properties. Catechin and Vitamin C are well known antioxidants. Japanese green tea contains both Catechin and Vitamin C. It is beneficial to drink Japanese green tea to remove these harmful free radicals. Too much cholesterol is known to cause arteriosclerosis, myocardial infarction (heart attack), and cerebral infarction (stroke). But not all cholesterol is bad or unhealthy. LDL cholesterol is bad and HDL cholesterol is good. Too much LDL cholesterol can cause cells in the body to oxidize and cause arteriosclerosis. Catechin, which is found in Japanese green tea, blocks the formation of bad LDL cholesterol and therefore is helpful in preventing arteriosclerosis. Not only does the Catechin in Japanese green tea prevent bad LDL cholesterol from forming, but it increases good HDL cholesterol levels in the body as well. Many studies have shown that ingesting Catechin promotes healthy energy consumption in the body of human beings and animals - and reduces fat in the body and digestive system. It has also been reported that Catechin absorbed into the blood stream reaches cells in the liver and works to promote fat metabolism. Catechin has strong antibacterial and sterilizing effects on germs and bacteria. It has even been found to have the effect of sterilizing germs (NRSA) that cause infections in hospitals, so Catechin is beneficial to ward off infection and sickness in this way as well. Studies have shown that Catechin can also prevent viral infections. Gargling with Japanese green tea has been shown to prevent influenza and the common cold and also helps to relieve symptoms of influenza and the common cold such as sore throat, cough, and nasal congestion. Catechin has an effect of moderating allergies (including airborne pollen/mold allergies and dermatitis). It is recognized that Catechin moderates the symptoms of allergies including itching and sneezing. Catechin is an effective deodorant and general sterilizing agent. A cup of Japanese tea after a meal prevents the growth of germs, which cause periodontal disease and halitosis (bad breath). Catechin is effective in preventing dental cavities. Catechin prevents existing cavities from becoming larger by balancing the enzymes found in the cavity area. By reducing harmful acids in the mouth which can destroy the tooth enamel, Catechin also works to protect the enamel and keep your teeth healthy and strong. Tea is the only plant that makes the amino acid Theanine, also known as Teanin or L-Theanine. Theanine stimulates alpha brain waves, which are associated with a relaxed but alert mental state. It helps relax the mind, allowing one to focus on the task at hand. Catechin is bitter and Theanine is sweet. These two elements create a perfect balance of taste. Controlled experiments have shown that Theanine has a positive effect on the mind and improves memory by increasing Dopamine levels. The experiments also show that alpha brain waves increase 40 minutes after consuming Theanine. People can take advantage of their full mental capabilities when they are relaxed. So try a cup of green tea 40 minutes before work or study! You might wonder how a cup of green tea, which contains so much caffeine, can be relaxing. The answer is Theanine. Theanine tempers the effects of caffeine, which can cause nervousness or excitability (as you might find with coffee) and works to relax the mind. So, although much caffeine is included in green tea, green tea does not cause nervousness or excitability because of Theanine. Much Theanine is found in tea leaves of Ichibancha (the first pick of the year) and Karigane (made from the stems of high grade tea). 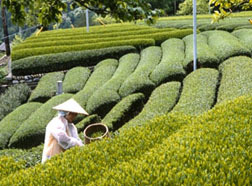 Gyokuro and Matcha are especially rich in Theanine because the tea leaves are grown in defused sunlight before harvest. Theanine is equally extracted both in low and high temperatures. Vitamin C, Catechin, and Vitamin E work together to enhance immune function. These three nutrients also help to make your skin more beautiful by reducing blemishes, wrinkles and sun damage. Vitamin C found in green tea is water-soluble, and the heat used in brewing tea does not reduce its potency. The mild caffeine in green tea has been found to increase cognitive performance, alertness, and energy. It can also help with weight loss through its stimulating and mild diuretic effects. The green teas with the highest caffeine content are Matcha, Gyokuro and Sencha. Houjicha (Bancha) and Genmaicha have the lowest caffeine content. The bioflavonoids found in green tea help to keep your teeth and gums healthy. You can gargle with green tea after brushing your teeth to kill germs and prevent bad breath. Tea is rich in minerals, including manganese, potassium and calcium, which help to alkalinize the blood, regulate the heartbeat, and build strong teeth and bones. With all Japanese teas (Gyokuro, Sencha, Genmaicha, and Houjicha) except for Matcha, you can ingest large amounts of the beneficial constituents by brewing three times. 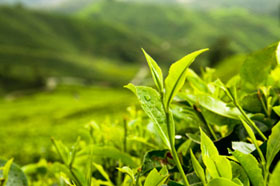 It is said that 30% to 50% of the constituents are extracted into water by brewing tea leaves three times. Green tea leaves have an amazing deodorizing effect. For example, you can burn dried used tea leaves as incense. The smoke will eliminate odors and make your room smell fresh. You can also put dried used tea leaves in your shoes to remove bad odors. Odors on cooking equipment like cutting boards and cooking pots can be removed by wiping them with damp used tea leaves. Wiping a steel pot or knife with used tealeaves can prevent the item from rusting. Tannin, an ingredient of green tea, makes an anti-rust coating on the surface of steel. Tea leaves have an antiseptic and astringent effect. You can gargle with green tea to kill germs or use as a topical antiseptic or astringent to keep your skin beautiful and healthy.